Friesen Friday = Party Time! This week’s project is self guided … that means that you are to make your own project using Christi Friesen’s Woodland Creatures Book as a guide. Sculptural projects are outlined in detail on pages 18-24 with other project examples multiple places in the book. Polymer Clay in whatever colors you will need (Remember this is your project, make it your own). This week’s project is very different from the others that we have done. This week we are each going to be making our own woodland scene. Sounds challenging? It might be! This project is all about what you want to make. There is only one rule … it must be a “woodland” scene. What does that mean? I’ll leave that to your awesome imaginations! If you can’t come up with anything on your own, follow the tutorial in Christi’s Book on pages 18-24 for a really cute woodland vessel. Don’t want to do that? Check out the awesome bird mirror on page 17. The possibilities are endless … have fun with this one and take your time. My piece took me half a day in the studio; yours may take longer or even less time. Be sure to set aside enough time for you to work and be creative! First, if your item will be a sculpture for a table top (or similar idea) make a base for it to sit on. Next you will need to make a faux wood grain for whatever kind of “tree” item might be in your scene. (See Christi’s Book pages 18-19)For mine, I covered my vessel including the top rim. Details were added later. After I got the tree covered with clay, I added a thick snake of triangle shaped clay around the base where it needed “bulked up” to look more rugged. Trees are always more “chunky” at the bottom … how do I know that? I live in the woods and looked out the window … hehehe. Now the fun part … add the details! I added mushrooms, made an awesome leaf cane, added a pumpkin in the back, rocks at the sides, bright purple flowers, and gemstones in tiger’s eye, goldstone, and quartz … and let’s not forget the star of the whole piece, Parker. And after all that time, do you know what you have? 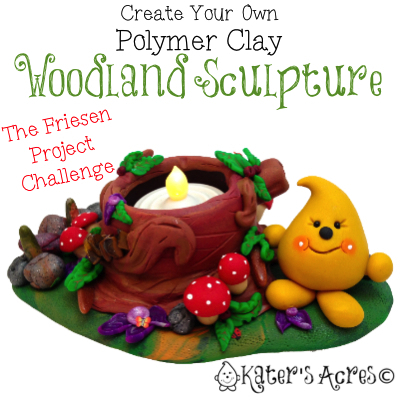 You have an awesome woodland sculpture that you created from scratch yourself! While my scene doesn’t have any animals in it, it does have both mushrooms, variegated rocks, flowers, Christi type swirls, beads, & more beads! ENJOY!